Some people have a gift for creating titles that capture the essence of their writing. I do not. But this time, I believe I have found just the right title for this memoir of childhood in Cuba inspired by a poem by Panamanian writer Ricardo Miró. Soon after I left Cuba, while living in Panama in 1962, I encountered this poem. Its nostalgia for the homeland moved me deeply at a time when I was in the midst of letting go emotionally of all that had been my life until then. I copied it on a notebook of poetry I have kept through the years. I believe this poem captures what I want to convey in these stories of my childhood and adolescence, lived in a world that does not exist anymore. Miró’s words still evoke in me the feeling of nostalgia for all that is no more. Despite the five decades that have elapsed since I left Cuba, the yearning does not abate. If anything, after living a busy and fulfilling life, at this stage I am very much involved in remembrance and pondering. This longing is not just for Cuba; it is also for the girl I was then and for whatever did not come to fruition for her in the intervening years because of the distance and absence from my homeland. I have made my own translation of the text, using words that sometimes do not coincide literally with his. But I believe I have kept the essence of the poem in my free translation. 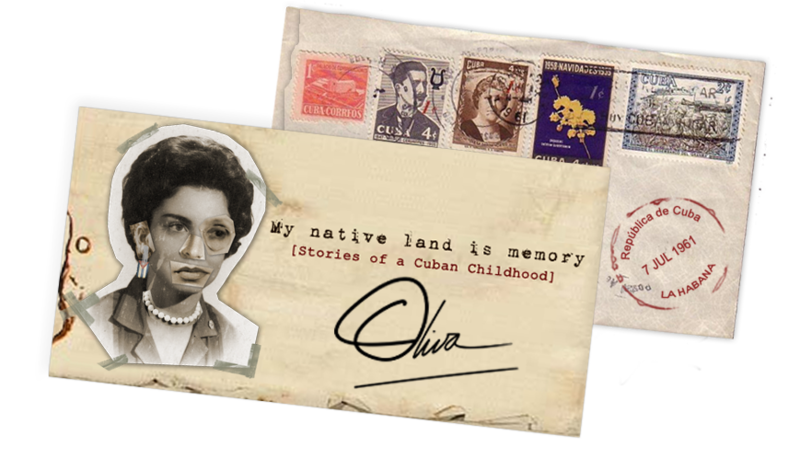 “Patria” and “recuerdo” are literally “homeland” and “remembrance.” “Native land” and “memory” evoke for me a more intimate sense of these words, and portray a more personal way of saying the same. At this point in my life, when so many things have been transformed, my native land is truly my memory. The memory of my native land is what this book is about. I am only including the verses of Miró’s poem that convey what I want to say and what this memoir is about. The shreds of life, the known music, the clear skies, the smell of the sea, the trees that guarded my childhood dreams, the distance from all I continue to yearn for after five decades. I think these words embody beautifully what I focus on in my memoir. The original words in Spanish and my translation of Patria appear below. the orchard without flowers, leaves or greenery. que al alma le conversan de un tiempo que pasó. who talk to our souls about a time that has passed. si el hado no dispone que atravesara el mar. if fate had not decreed that I would cross the seas. llevarte por doquiera dentro del corazón. carry you all over the world within my heart.